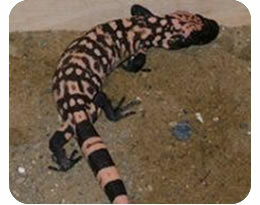 Gila (pronounced ‘heeler’) monsters are named after the Gila River Basin, Arizona. Heavy and slow-moving, they are America’s most venomous lizards. Unlike snakes which use hollow upper fangs to inject venom, Gila monsters secrete venom through grooves in lower jaw teeth; this mixes with saliva and gets into the victim’s bloodstream as it is chewed. There are no confirmed reports that the venom is fatal to humans. A drug using a synthetic form of the hormone ‘exendin- 4’ – that occurs naturally in Gila monsters – helps ‘type 2’ diabetics keep their blood sugar levels from getting too high.